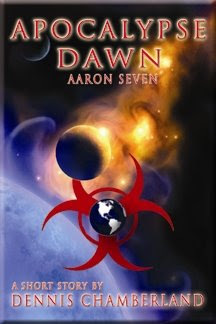 Dennis Chamberland has announced the next in the Aaron Seven saga in addition to the release of the new Aaron Seven website. When a virus escapes from a military laboratory, there is just no way to stop it from killing every human on the planet. The only escape is to the surface of the moon where a new society will be established to save the human race from certain extinction. But the plans are not complete and Aaron Seven is called upon to develop the most advanced life support system ever conceived after he arrives on the moon. The question is whether the human colony can survive its own plan returning to earth is not possible and the clock ticks down to the inevitable end. Available in mid-2009 in soft cover and eBook. It will also be available from Amazon.com. Check out the new Aaron Seven website! The new website also includes a FREE short story version titled "Apocalypse Dawn".